In 1929, two of the country’s oldest and largest banks, The National City Bank of New York and The Farmers Loan and Trust Company merged to become the City Bank Farmers Trust Company. The new conglomerate chose renowned architects Cross & Cross to design a new skyscraper that would solidify the banking institution's presence on Wall Street. The new building became one of Lower Manhattan's most iconic skyscrapers, known for its ornate design and towering height. The newly merged bank decided to build its new headquarters just south of 55 Wall Street on a full block occupied by four buildings including, the Farmers Loan and Trust headquarters and the Canadian Bank of Commerce. The new headquarters at 20 Exchange Place was designed to connect to the previous space at 55 Wall Street via a cast-aluminum pedestrian bridge 109 feet above the street. The site of Twenty Exchange Place, bordered by Exchange, William, Beaver and Hanover Street in 1925 before construction started. Farmers L & T and Canadian Bank of Commerce are both seen present occupying buildings on the block, which would be demolished to make way for the skyscraper. The National City Bank at 55 Wall Street is across the street, making it a perfect location for the bank's new headquarters. Bromley Atlas, 1925. In 1929 Cross & Cross unveiled a proposal for the tallest building in the world: a 71-story, 846-foot tower topped with an illuminated globe fifteen feet in diameter supported by four massive eagles. However, following the New York Stock Market crash and a failed merger with the Corn Exchange Bank (located directly across William Street), which would have made them the largest bank in the world; the Bank was forced to reduce the height to 741 feet and replace the globe with a two-tiered limestone crown. Left: Original rendering from Cross & Cross of the 71 story, 846-foot tower topped with an illuminated globe that hoped to be the tallest in the world. Right: Twenty Exchange as built, 1931. Once construction began the skyscraper rose at a record pace and was completed in February 1931, less than a year later, despite challenges caused by a subway line, quicksand on the site, and mechanical and zoning issues. By the time of completion both 40 Wall Street and the Chrysler Building had topped out, giving the City Bank Farmers Trust Building — as it would be officially known – the title of fourth tallest for a brief time until 1931 when 70 Pine Street and the Empire State Building would bump it down another two spots. Even if the original proposed height of 846 feet – which only had one contender in 1929, the 792-foot Woolworth Building – had been achieved, it would have been quickly surpassed by 40 Wall Street and the Chrysler Building. While Cross & Cross believed their design fell into no particular category, the skyscraper reflected many styles and influences. 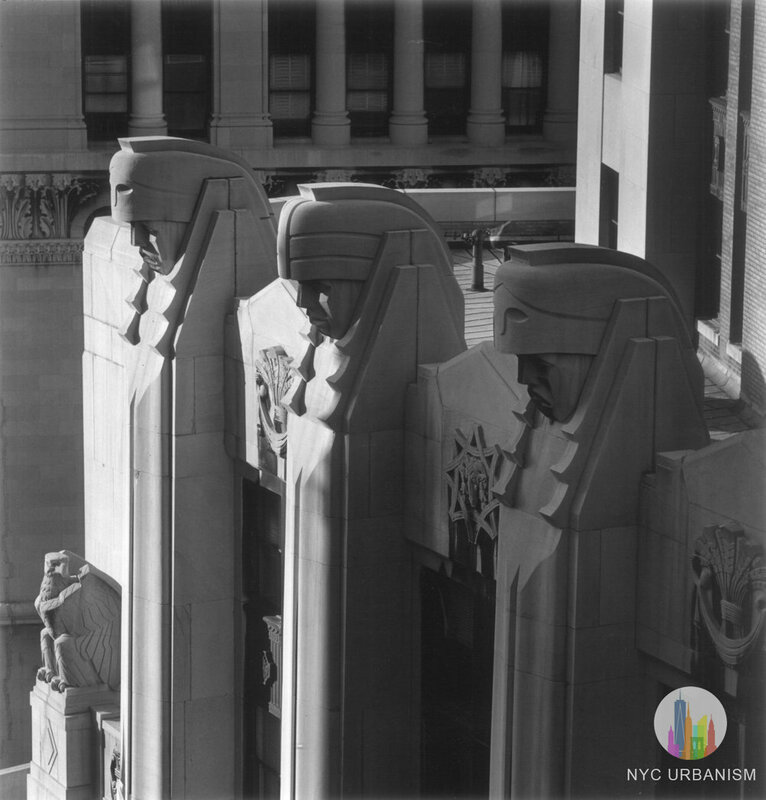 The Landmarks Preservation Commission’s designation report called the design a "restrained modern style once known as 'Modern Classic." Additionally, Art Deco ornamentation is particularly visible at street level and Gothic influence distinguishes the round-arched windows and openings at the top of the building. Coins surrounding the entrance depicting countries where the bank had branches. View from the East River Piers, September 17, 1932. One unique aspect of the design was the architect's insistence on high-end materials. The facade is clad in fine stones including Mohegan Granite and Alabama Rockwood Limestone. Silver nickel was used instead of bronze for the decorative ironwork for the first time in a skyscraper. Inside, the architects used forty-five varieties of marble to adorn the spaces, forty-two of which were internationally imported. Overall, construction of the skyscraper required 27 million pounds of Alabama Rockwood limestone and 300,000 square feet of marble. Until the completion of the Empire State Building, Twenty Exchange was the tallest stone building in the city. Located on a trapezoidal block, Twenty Exchange's base follows the irregular shape of the block, until three setbacks, resulting in a slender square tower with chamfered corners rising from the twenty-eighth floor. The exorbitant base features an array of sculptures, reliefs, seals, plaques, and medallions both inside and out. Eleven granite coins surrounding the arched entrance on Exchange Place represent the many countries where the bank was located. On the nineteenth floor at the first major setback, fourteen massive Assyrian inspired heads –half smiling and half frowning- known as "The Giants of Finance", – look down on the street below. Columns that are not capped with a Giant, are capped with sculptural eagle two levels below. Inside, silver nickel (a rare alloy of copper and nickel) decorative ironwork representing modern modes of transportation from trains to airplanes line the windows, while murals depict New York City historical scenes, and motifs such as animals, hourglasses, and scales line the banking halls and lobby. A grand rotunda at the corner of William Street greeted visitors as they entered the bank branch and senior offices. Left: rotunda with sphere above. Right: crawl space with lights illuminating the sphere to light the rotunda. When the building first opened it provided two separate banking halls with entrances on opposite street corners. The Hanover Street entrance was originally designed for the Canadian Bank of Commerce branch and offices that had previously occupied the block since 1872. The William Street entrance leading to the rotunda, provided access to the City Bank Farmers Trust Branch on the lower level, and grand hall housing the senior offices on the upper level. Sixteen bank vaults were built for the banks, the majority of which are in the lower five-story basement. The Exchange Place entrance, in the middle of the block, led to an elaborate marble lobby with colored mosaic panels and elevator banks that access the offices in the tower above. Above: Original Canadian Bank of Commerce banking hall. The mural behind the tellers counter, depicting historic New York City scenes, was originally a map of Canada. The mural, which resembles 1930s/WPA murals, was added decades later, after the bank vacated the space. Below: Original map of Canada; New York Times, May 25, 1931. Technologically the skyscraper was just as complex as it was decorative. The building featured the largest pneumatic tube system in the world, the largest telephone exchange in the city with a capacity of 45 million calls per year when it opened in 1931, and reservoirs in the basement that pumped hand soap to all the bathrooms. In 1955 the bank was renamed First National City Bank of New York and relocated its headquarters from Twenty Exchange to Midtown a year later, still owning and occupying the skyscraper. In 1976 the First National City Bank of New York was officially renamed Citibank. In 1979 Citibank sold the building but remained a tenant until 1989, the same year the Canadian Bank of Commerce finally closed its branch and offices in the building. The largely vacant skyscraper would continue its use as a commercial office building, with both street-level branches empty, until 1996 when it was designated a historic landmark and purchased by the Witkoff group the following year. Witkoff began a $25 million dollar renovation in 1997, maintaining the historic structure while attempting to attract new commercial tenants. By the mid-nineties, Twenty Exchange was one of many largely vacant commercial office buildings in the Financial District and planners and developers searched for solutions. Under the Giuliani administration, new economic and regulatory incentives encouraged reinvestment into these older buildings, while changes to the zoning code made "live-work" spaces legal, and federal historic preservation tax credits could be used for buildings designated as historic landmarks. Investment in these vacant office buildings was further incentivized with a 14-year abatement on property taxes for office buildings converted to apartments. It was during this time the first Financial District residential conversions started taking place. Not only were buildings like Twenty Exchange largely vacant, but they were prime candidates for residential conversion due to their access to light, tremendous views, and smaller floor plates. In 2004 Metro Loft Management acquired Twenty Exchange Place converting the upper floors into residential apartments. Amenities at 20 Exchange include an outdoor terrace overlooking the Giants of Finance. In 2014 the new owner, DTH capital, received a $240 million loan to convert the lower floors into luxury apartments, provide new tenant amenities, and establish retail space on the street level. Today the skyscraper has 767 units with only 2% vacancy. Amenities include a lounge, billiards, and an outdoor terrace on the 19th floor overlooking the massive limestone “Giants of Finance.” Due to the location and height of the building, units are graced with tremendous views of the surrounding city. After almost a third of commercial office buildings were vacant in the early Nineties, residential conversion has been a major force in Lower Manhattan's revival over the past decade. Although Twenty Exchange is a historic landmark, protecting everything on the exterior from the ornamentation on the street level to the Giants, the lobby and banking halls were never designated as historic landmarks. Fortunately, the banking halls have become revenue generators as film locations. The building has been seen in movies including the original Wall Street, The Amazing Spiderman 2, and most notably Inside Man. Without providing access to the public an interior space cannot receive landmark designation. Luckily, the owners have expressed interest in preserving the historic spaces. Let's hope they will stay protected from a future Rite Aid or Chipotle looking for a prime Downtown location! Giants of Finance. The photo on the left shows one of the eagles (bottom left) that top the columns that end one floor under the Giants. Left: ram's head over service entrance. Right: iron grillwork along lower level windows visible from the sidewalk with scenes depicting law, finance, architecture, engineering, chemistry, metallurgy, farming, medicine, navigation and manufacturing. Left: National City Bank of New York logo above the entrance. There is also a seal for Farmers Trust and Loan. Middle: entrance to the original branch and senior offices. The Rotunda is on the other side of this entrance. Right: entrance detail. Left: elevator door. Middle left: marble details. Right: babies surrounding the windows in the senior offices depict various scenes. Seals on the doors depicting modern modes of transportation. Left: entrance to former Canadian Bank of Commerce. Middle: Canadian Bank of Commerce seal over door. Right: view up of the tower from the nineteenth floor. While most of the building is limestone, white brick was used in the middle of the tower surrounding the windows. Over time the white brick became discolored, eventually creating dark vertical bands by the late Eighties. A restoration in the late Nineties restored the bricks to their original color.